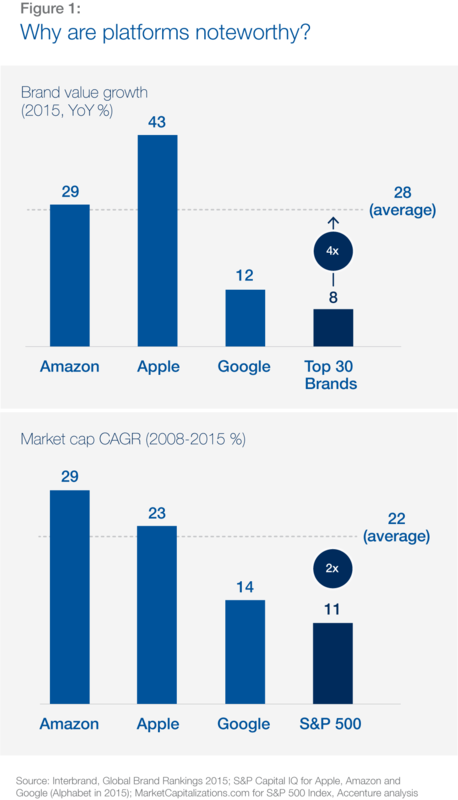 Platforms are outgrowing and outperforming other firms. As they start to dominate the digital landscape, new governance models will be needed to effectively regulate the platform economy. Since its inception, the internet has always required governance of some form at each of its three operational layers – physical (infrastructure), logical (device-server communication) and economic/societal (users interacting with the internet). Each of these layers throws up unique regulation challenges and governance issues that need to be resolved through collaboration. The economic/societal (“top”) layer, however, is the most complex from a stakeholder interaction perspective and is currently the least regulated. This is also where platforms like Google, Amazon and Apple exist. These platforms are visible to consumers in many ways, including mobile operating systems (such as Android, iOS, Kindle Fire), third party developer communities (for example, Google Apps Marketplace) and user-friendly apps (such as Google Maps, Apple Music and Amazon.com). Improving connections with people: e.g. messaging friends on WhatsApp or using LinkedIn to build an online profile. Gathering and sharing information efficiently: e.g. using Google Maps to check the driving time between two places or uploading inspirational YouTube videos. Efficiently match supply and demand: e.g. booking an Uber taxi or online shopping for delivery within an hour with Instacart. However, many platforms have now started to use these (often) low-cost or free services to create advantages for themselves; “platform lock-in” being among the most common (similar to “vendor lock-in”). One such issue is with Google, who since 2010 has been involved in a legal battle with the European Commission over allegations that it skewed search results to favor its own vertical search services (such as Google Travel or Google Shopping) over similar services provided by competitors. The biggest platform governance challenge in the future will be to foster collaboration between global players in a way that maintains the high level of interoperability that digital users have enjoyed in the past. Walled gardens – or mini national internets – are problematic because they diminish some key benefits of platforms (global information sharing, connectivity and trade) without necessarily alleviating the disadvantages (such as unfair competition.) If a multi-stakeholder model is adopted, platforms will need to work together with academic, non-profit, government and technical actors, to ensure that they can continue to both reap and provide the key benefits that we have become accustomed to. Many firms will start to embrace platforms (either by creating their own proprietary platform or by entering a leading platform’s pre-existing ecosystem) as a means of accelerating innovation, acquiring new customers or maximizing profit, among other objectives. Many non-tech firms have struggled to pinpoint a value-creating implementation approach to help them capture the benefits of platform economics. However, Unilever has recently proven that it is possible. In May 2015, the consumer products giant introduced the Unilever Foundry, a platform that aims to keep Unilever marketing agile, fresh and innovative by partnering at scale with start-ups. Start-ups from around the world can apply technology solutions to Unilever’s marketing challenges in exchange for mentorship and a path into the company. Although Unilever has a long history of collaboration with start-ups, the Unilever Foundry will help scale up this practice and embed it as routine in the wider organization. Unilever, for whom marketing is a critical function (with high marketing spend as a percentage of revenue), has invested in creating a platform that will give it access to some of the best marketing technology in the world. In turn, as Unilever gains scale, its suppliers will benefit as the demand for new products will drive increased demand for raw materials and thus revenues to suppliers. Independent of the governance and regulation measures that may appear in the future to curb leading platforms’ immense market power, successful platform-minded organizations will see continued growth, profitability and relevance. Several dilemmas also exist that need to be considered: Do you compete or partner? Do you have an open or proprietary platform? Do you invest or leverage existing platforms? Do you have a platform business model strategy? Is it consistent with your role in the industry? Do you extend, maintain or change your role, and how will this affect your choices for creating a platform versus ‘plugging in’ to others? What are some of the unintended consequences (both positive and negative) of platforms? How should customer interests be protected? What adaptive frameworks for regulating platforms could be put in place so that societal benefits can continue to be realized? Further research and analysis is due to be conducted on platform governance as part of the DTI initiative throughout 2016. Platform governance is one of four cross-industry themes (along with digital consumption, digital enterprise, and societal implications) that have been the focus of the World Economic Forum’s Digital Transformation of Industries (DTI) 2016 project. An overview of the DTI programme can be found here.